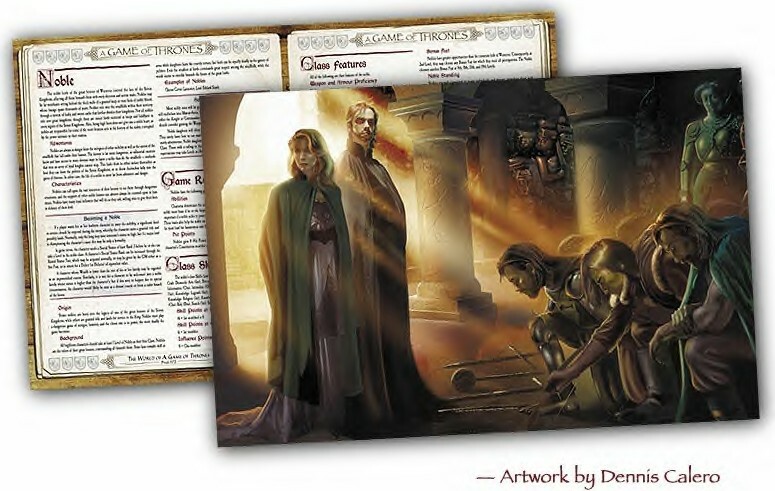 Guardians Of Order is now taking pre-orders for a special Deluxe Limited Edition of their long-awaited and highly anticipated GAME OF THRONES role-playing game. The book is intended to be an authoritative reference guide to the series and the world of Westeros, and will feature over 450 pages of breathtaking colour artwork and detailed analysis of setting, plot, characters, and culture of the Seven Kingdoms. The first 500 copies of the numbered Deluxe Limited Edition will be autographed by yours truly. The good folks of GOO tell me those copies are going fast. As of today, they have sold just over 300 copies, and have fewer than 200 left. So if you want to snag one of the signed books, act now. They are available exclusively from Guardians of Order via their website. “This is a once-in-a-lifetime product,” said Guardians Of Order President, Mark C. MacKinnon, “and we are privileged to present this A Song of Ice and Fire resource guide to George’s many fans worldwide. We worked closely with George to create a book of the highest quality, and spared no expense in its creation. He personally reviewed the text for authenticity, and has provided us with additional background information where appropriate. It’s the perfect companion for aficionados of A Game of Thrones. The limited edition will feature premium-quality paper, a foil-embossed leatherette cover, an exquisite dust jacket featuring art by Mike S. Miller (the artist on the Hedge Knight graphic novel), a cloth bookmark, a full-sized colour pull-out map of the Westeros continent, and a host of stunning artwork and graphic designs by a team of exceptionally talented artists. I have seen all of the text and much of the artwork for the RPG, and it promises to be a gorgeous production. GOO has devoted painstaking effort to making this game one that every fan of the series will love… and even those of you who are not gamers may find the book invaluable for the wealth of information it will contain. This deluxe RPG contains two core game rule systems: the popular d20 system, and GOO’s own critically acclaimed Tri-Stat System. As a complement to pre-ordering the limited edition, Guardians Of Order is also enclosing a Game Master’s Screen and introductory game adventure with all orders. A Game of Thrones RPG and Resource Book (ISBN 1894525841; Product #16-099) is available for $99.95 USD (plus shipping) from http://agot.guardiansorder.com .